Optimization is not straightforward, some results can be achieved by pot luck based on your current content or purely on how long your website has been up and running or established. But this also goes for all the other thousands of website that are in your business area. For Example. This website will be optimised for one of the Keywords of "Website Optimization London"
Now There are hundreds if not thousands of individuals or businesses that are offering these SEO services, specifically through the web, as this is what they do, and by offering these services you would hope that they are good at what they do and so should feature very highly in search engine rankings. But you will also note that you can spell Optimisation as so but also as "Optimization" The american spelling. A quick search in Google tells me that there about 7,520,000 results for these three keywords and 54,000,000+ for the other spelling of Optimization. 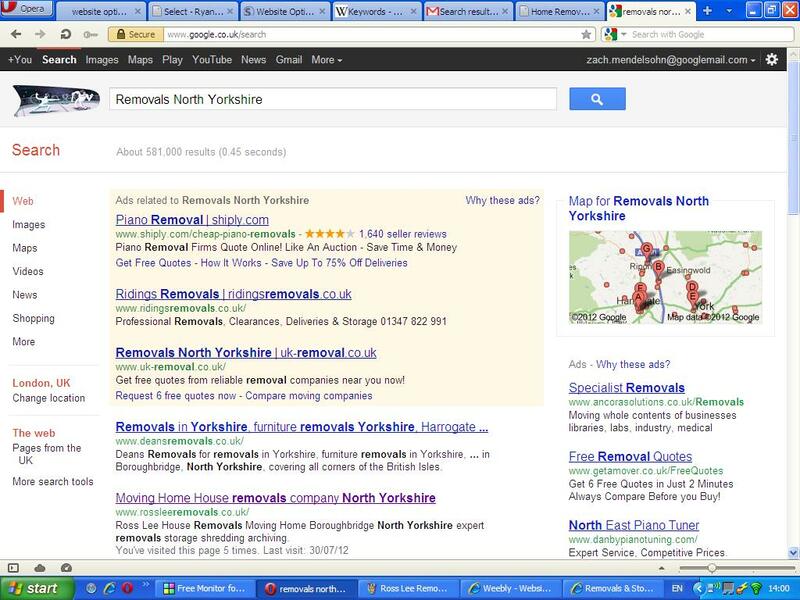 Of course only 9 or 10 of these businesses can appear in the first page of search results. Now these guys must be good? Possibly, it could be that they were one of the first to set up their website optimised for these specific keywords many many years ago, but also they would have had to keep their sites up to date and continued optimising it to beat off any competition. However there are many things that can be done to help your website feature highly and help you get more visitors to your website, even if you are just setting up a new website, which is the best time, to ensure your website is set up correctly in order to be ranked highly by search engines. The Art of website Optimization is based around quite a few key things that are essential to get your site to rank highly but also about trial and error, but more importantly work and patience, as optimisation results are not instant and the effects of changes made may only be realised many many weeks later. Build, design & manage your website - creating useful content and adding useful gadgets for your visitors. Assess your competition and rivals in your business sector and provide you with ways with which we can gain more visitors and customers. Promote your website through my existing portfolio of websites providing useful "backlinks"
Use the plethora of free advertising opportunities available on the web, bringing in more hits and customers. I will aim to get as many of your keywords into the first page of Google as possible. So what do you do if you're competing against thousands of other businesses online and you still want to get people visiting your website without having to spend months of optimising and competing against established websites? The proof is in the pudding..........! As you will see for the search engine results left, I have achieved page 1 listings for all my keywords with Kennington in a little over 2 weeks. 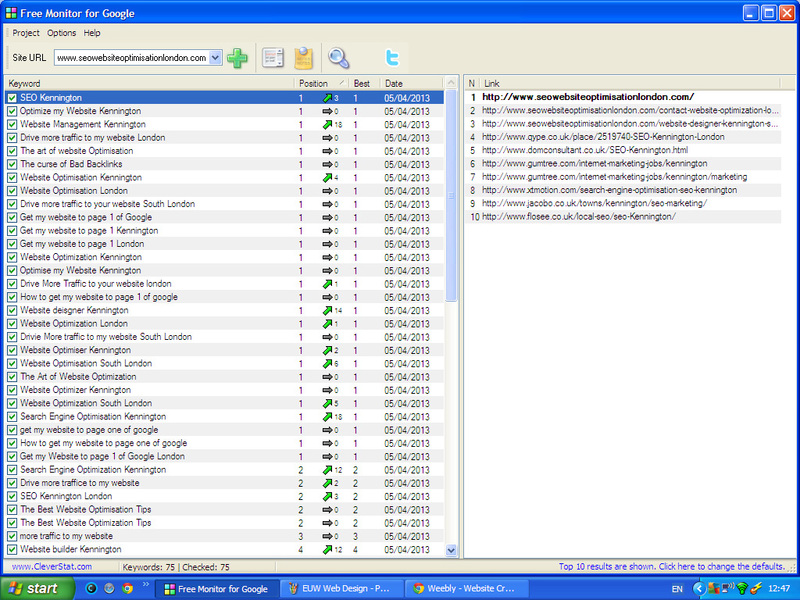 I have also managed to get a page 1 listing for Website Optimization London. Initially I was a little unsure of attempting to conquer London, I shall now optimise further and attempt to capture more London listings. This will include, "get my website to page 1 of Google" with and without the prefix of London. I shall also add the keywords "the Art of Website Optimisation". with and without the other keyword London. As you will see from my own website optimization results, I'm good at what I do, if i can't do it for my own website and prove how good I am by being No.1 in Google and using purely natural and White Hat Techniques. Please feel free to contact any of my clients and they will provide the assurances and the recommendations that speak for themselves. I don't give empty promises, request more time, complain of Google updates or other issues. I do what I say and I do it well and quickly. I don't send out spam emails to businesses telling customers or website owners what is wrong with their website, with completely unrelated information that clearly has not been researched. I believe if your advertising SEO Search Engine Optimisation Services then your clients should be able to find you.....................and you do that by being No.1 in Google. Well, there are several things you can do....................! In the image above you will notice the first three results are shaded in pink, these are paid for advertising, companies or businesses who have paid to have there webiste appear here for the set of keywords the searcher has typed in. 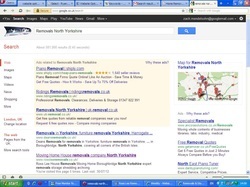 You can optimise your website for Obscure Keywords associated with your business. These will not generate as many hits as fewer people will use these words when searching for your business, but it does give you the hope of appearing in the first page of google where you will actually get hits. 3. Me - I have a proven track record of getting websites into the first page of Google and other search engines for popular keyword searches and I also enjoy it. Generally people looking for a website optimizer would search using the keywords "Website Optimisation Services"
But I have optimised this site for the keywords of "Get my website on the first page". Obviously less used but again some people won't know the correct terms used to find my SEO services. Alternatively we could optimise your services to a specific location. London would probably not be a good one as this is probably the most competitive due to it's size and some businesses are searched for by a more specific location because London is such a big place and the amount of competition and subsequent returns might not make it worthwhile, but I can do this for your website if it is the most appropriate Location and Keyword for your business and will attract those all important visitors to your site. Alternatively you could optimise for a more specific business location, which users and visitors might be more inclined to search for such as South West London or we can cover all the postcodes and locations in W1 and specific places such as Hammersmith, Putney, Kensington etc. And we could even be more specific and use your exact place / location name, For me that would be Kennington in London. I for one am very keen in using and supporting local businesses in my area and this may also be what your customers want. For this website I am using a free website builder called Weebly and I am experimenting with this site to see how good and how easy it is to optimise based on my experience with other website building software and other website applications. It is obviously a free, quick and easy website editor and therefore will enable me to offer my services at a different price point.